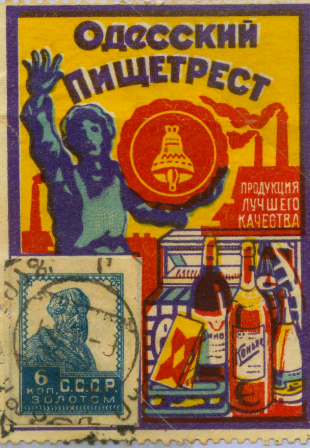 Special labels advertising various Soviet commercial, trading and banking enterprises to be used with affixed postage stamps on mail were introduced in 1923. This was part of the New Economic Policy based on a gold standard of currency to overcome the financial disaster of runaway inflation following the 1917 Russian Revolution and the five-year civil war throughout the territory of Russia. Although dedicated to total socialism and central government control of all facets of business, agriculture and industry, the Soviet government recognized the need for capitalist intrusion to jump-start the economic reform. Special business entities were established, called Trusts, Syndicates, Trading Offices, Industries, Stores, etc. To promote these enterprises an advertising-publishing commercial agency, called SVYAZ ("communication") was created and attached to the People's Commissariat of Posts and Telegraph [N.K.P.i.T.]. This agency issued graphic arts designed labels featuring various enterprises, goods and services. The labels were to include a postage stamp ofthe new gold standard currency designation and used on ordinary mail. The labels had no value and were free of charge at the post offices. They could be used anywhere on any mail.